Once you have entered a meeting room as a speaker, you will need to click on the icon "show desktop" that appears i n the toolbar on the left hand side (please see below). 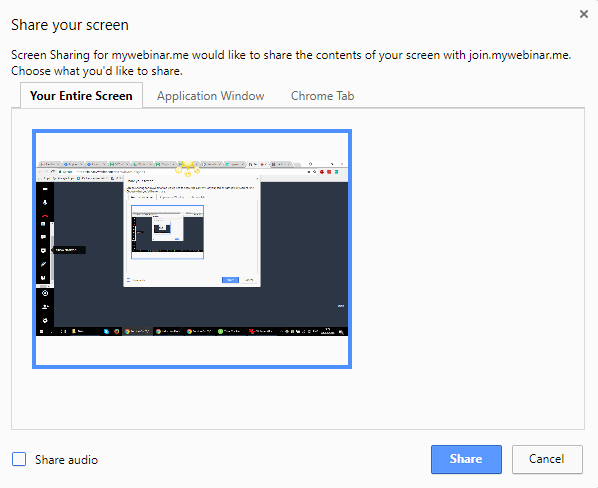 Please remember that you will need to install the required plugin/extension before you are able to share your screen. If you do not have it installed a pop up like the one below will appear with instructions on how to do this. Please see example below. You have a Notepad, your browser and Irfan View open. You clicked on the “Application Window” option and selected the Notepad (1) in order to start sharing it (2). The only thing that the rest of participants will be able to see during the meeting will be that Notepad. All the other applications that were not selected will not be seen. Once you have clicked on "Share" a green dot will appear by the "Show desktop" icon . This will allow you to know when your screen is been shared with your audience. Also a message like the one below will appear on the bottom part of your screen. You can leave this open and when you are ready to stop sharing your screen click on "Stop sharing", or you can hide it and click the "Show desktop" icon when you are done with your screenshare. You will know that have stopped sharing your screen when the green dot disappears.